I know I know….. I totally set myself up for addictions! 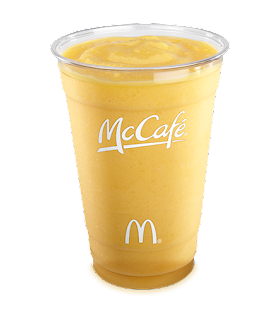 After chatting with a few of my fabulous readers on my facebook fanpage I had no choice BUT to try out Mickey D’s new pineapple mango smoothie! I know that I just recently beat my addiction with the strawberry real fruit smoothies, but I feel stronger now. Honestly I don’t think I’ll be throwing these mango pineapple smoothies back like the other ones. The verdict: I LOVE THEM!!! Have you tried these smoothies yet? Which one is your favorite? hey love the video as always ! keep the good work! sheneice ur fb friend! Hey, what's the deal with all these posts and no new recipes? I don't want to see videos about McDonald's and processed smoothies. When are you going to post some real recipes? I hope McDonald's gets wind of this video and sends you a coupon for a free one (or two)! You told them you had a coupon!!!! grr that makes ME mad lol.